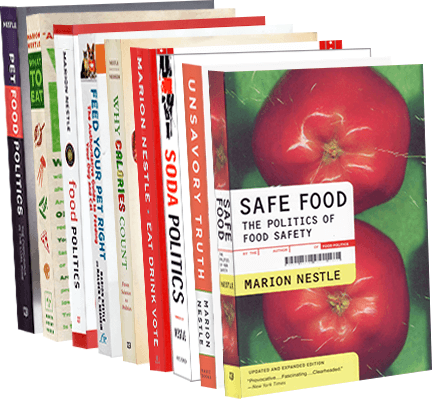 Food Politics by Marion Nestle » Food is political? Indeed it is. Food is political? Indeed it is. Every now and then, I enjoy answering questions posed by Eating Liberally’s Kerry Trueman. Here’s one for today. Let’s Ask Marion: How Did Junk Food and Obesity Become a Red State/Blue State Debate? kat: The “agri-culture war” that’s long been simmering is coming to a boil now, as recently noted in The Washington Post, The Daily Dish, and elsewhere in the blogosphere. The Palin/Beck/Limbaugh axis of egos is vigorously defending junk food, lamenting the passage of the food safety bill, and decrying all efforts to address our obesity epidemic, even as David Frum, a rare voice of reason (sometimes) on the right, tells CNN that obesity poses a greater threat to our national security than, say, openly gay soldiers. You yourself are under fire yet again (sigh) from those uber-astroturfers at the Center For Consumer Freedom for having the audacity to question whether our cherished principle of free speech entitles Big Food to emblazon the labels of its edible food-like substances with Big Lies (i.e. dubious, unproven health claims). Why do you think that the issues of junk food and obesity have become so incredibly politicized? Dr. Nestle: Politicized? Of course they are politicized. Junk food and obesity are key indicators of political divisions in our society. For starters, junk food is cheap and obesity is more common among low-income populations. So right away we are into divisive issues of income inequality and class and, therefore, who pays for what and which sectors of society get government handouts. The minute we start talking about small farms, organic production, local food, and sustainable agriculture, we are really talking about changing our food system to accommodate a broader range of players and to become more democratic. Just think of who wins and who loses if $20 billion in annual agricultural subsidies go to small, organic vegetable producers who are part of their communities rather than to large agricultural producers who do not live anywhere near their corn and soybeans. The issue at stake is who gets to decide how food is grown and what people eat. For as long as I can remember, big agriculture and big food were in control, in close partnership with congressional agricultural committees and the USDA. Today, the food movement–democracy in action, if you will–is challenging their authority and power. No wonder defenders of the status quo don’t like the challenge. It is only to be expected that they are fighting back. I see the intensity of the debate (and, alas, the personal attacks) as a clear sign that the movement is making headway. The system is clearly changing. It has to change if we are to address obesity, climate change, and the other unsustainable aspects of our present ways of doing food business. Anyone who is working to reduce income inequity and to make healthier food available to every American has to expect to encounter the methods corporations always use to fight critics: personal attacks, claims of junk science, invocation of personal responsibility, cooptation, and plenty of behind-the-scenes lobbying. Telling truth to power has never been popular. But I’m convinced it’s worth doing.